Did you know you can get the look of stainless steel appliances for cheap?! 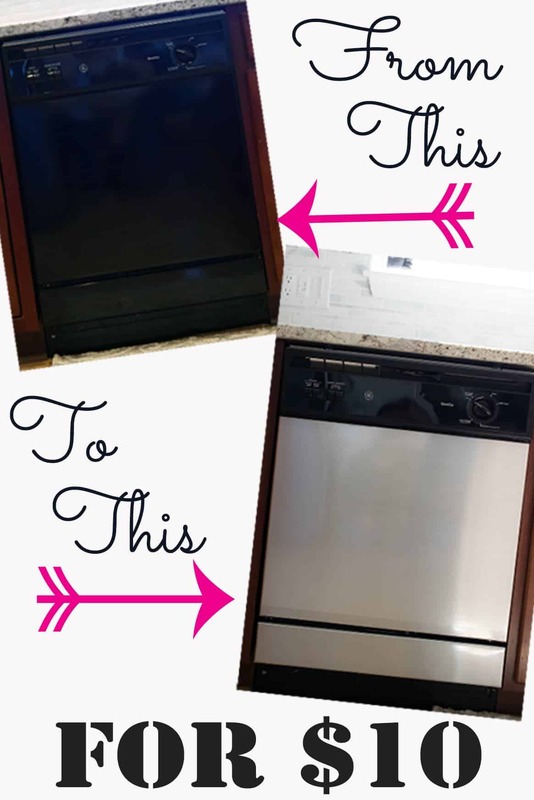 Using Stainless Steel Contact Paper is an inexpensive way to update the look of your dishwasher and this DIY project only takes maybe an hour. So let’s get started! Hello, friends! 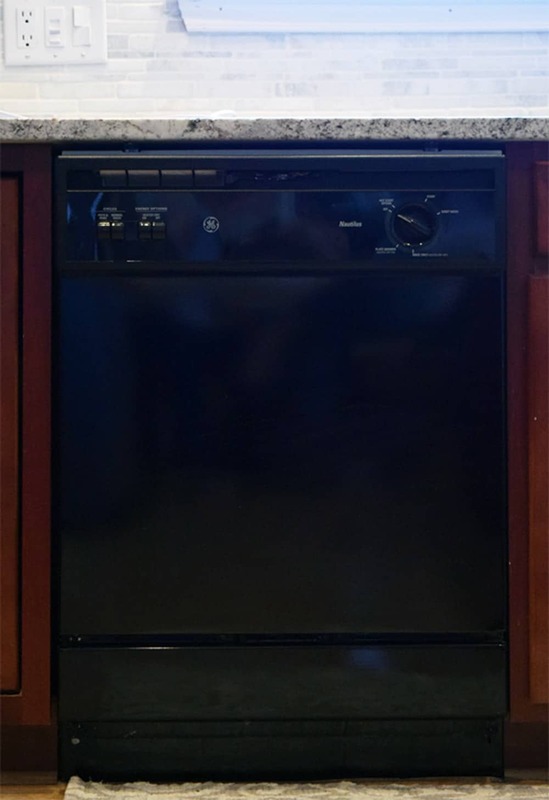 Today I am sharing how I upgraded our appliances by covering the dishwasher in contact paper. Yes, you read that right! Contact paper! When we remodeled our kitchen, I was in an “all black must go” kind of mood. Still am, actually. But in my thrifty DIY adventures, I hate throwing out something that is functioning well. So we decided that covering the dishwasher front was the best way to go for now. This is the original dishwasher and, apparently, it is pretty hard to photograph scratches on black but it had a few deep scratches, a lot of abrasion scratches, and a few dings. 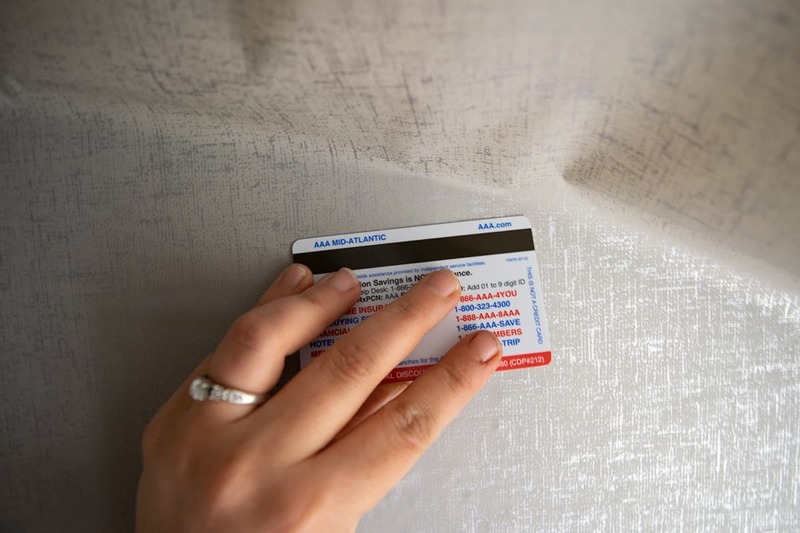 Contact Paper – These come in rolls like this or in sheets that are made for dishwasher size. I like the sheets – less lines. 1. I won’t lie, this is a 2 person job. It’s not hard though and the whole thing took about 1 hour to put on (I am slow and precise). 2. A couple of friends have made the comment “Oh, you must have a lot of patience”. I sort of scoff at that because although it is tedious I suppose, it’s a relatively small area. I am proud because it really does look great and authentic. 3. If you do get a small bubble that you can’t smooth out, use a sewing needle and poke a super-tiny hole to release the air and flatten it out. 4. I purchased my stainless steel contact paper here. It really does look like stainless steel appliances, it has the horizontal lines and matches my real stainless fridge exactly. 5. The after picture was taken 4 months after installation. We run the dishwasher almost every day and I worried that the heat and potential steam from the dishwasher would affect the contact paper over time. It hasn’t, but I did make sure the wrapped sides were firmly attached to the dishwasher glass well with no loose ends. First, clean and dry your surface thoroughly. Starting with the top part of the dishwasher, cut the sheet of contact paper to size so that it wraps around each side (I cut mine a little larger just in case). Gently peel the backing down, at least, several inches evenly, making sure that it does not roll back on itself. I highly recommend two people and you can peel the entire backing off. As you can see above, my husband was asleep when I decided to do the bottom of the dishwasher. I felt more confident since this was a much smaller sheet. Line up the top of the contact paper where you want it so that only the tip touches the surface. Your assistant’s job is to hold the working material so that it doesn’t touch the appliance or fold back on itself. 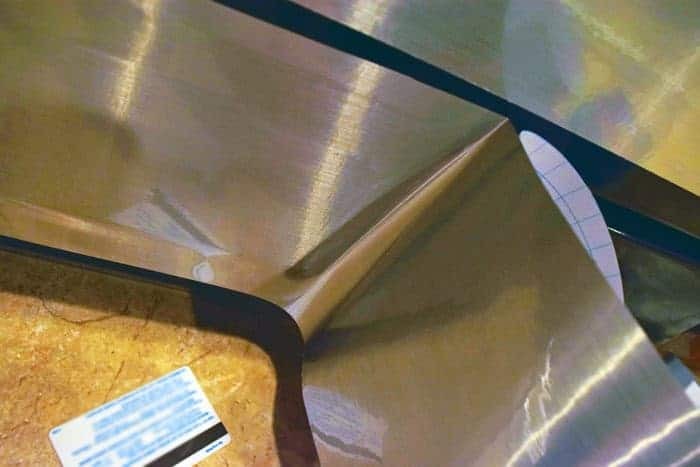 Using a credit card or flat plastic scraper (not metal), move evenly from one side to the other, moving in the direction of the stainless grain. Move horizontal 1-2 inches, then even out vertically. Watch for any bubbles as you work and push them out or lift the contact paper back up a bit and redo. Patience is key. The picture of this technique was unrecognizable but this is the same technique as I use with wallpaper. Covering the dishwasher was a bit trickier with the corners. After cutting the sheet, I smoothed out the front and then cut these wings on the sides. This way I could fold the top and bottom down first, wrapping around the side edges a bit. Then the sides are smoothed down and the excess is cut off. Tada! I think it is pretty awesome for $10. If your looking for where to buy contact paper that looks like stainless steel, here is a really large product that should work! What is the contact paper you used? Can you provide a link? 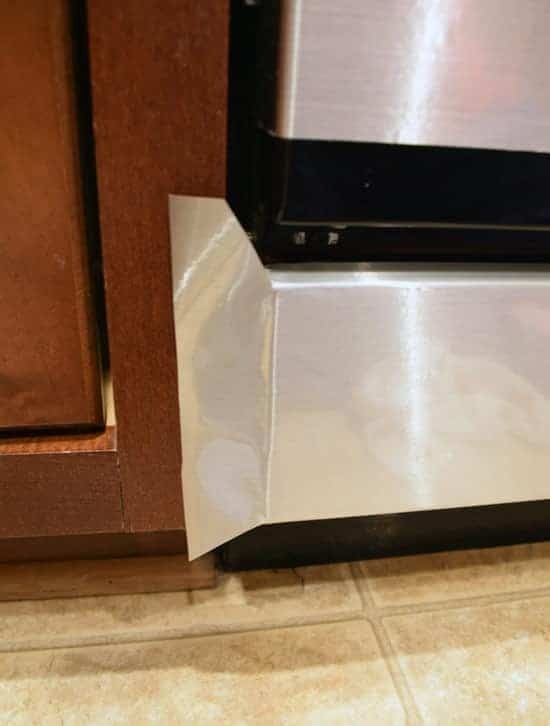 All the stainless contact paper I find isn’t wide enough so you have to use two pieces side by side to cover the whole door. Hi! The contact paper that I used was from home depot but you can also find it on Amazon: http://amzn.to/2aYPvab The 18 inches is about 1 inch short for my style of dishwasher but you have to really look to notice it as I lined the pieces up pretty well to cover the whole area. 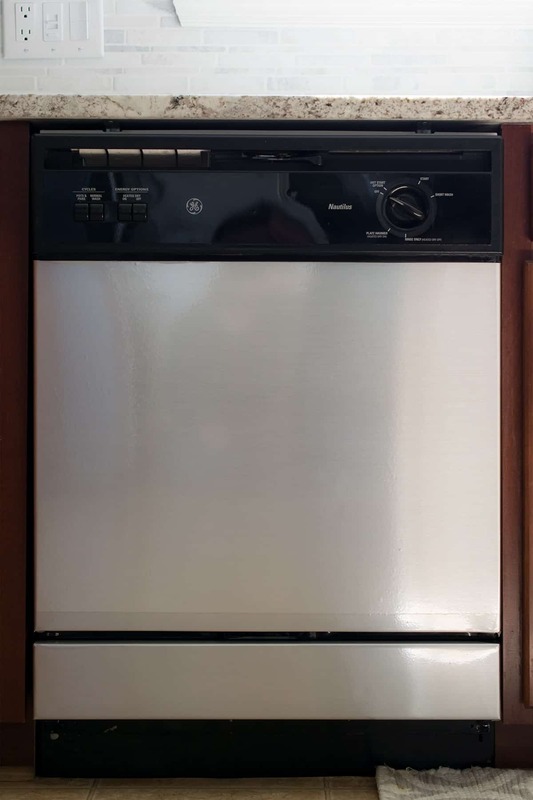 However, if you have a larger or completely flat fronted dishwasher, there is this one: http://amzn.to/2blnZsk and it even works with refridgerators. I haven’t tried it personally, but I also found this magnetic option that seems rated highly: http://amzn.to/2blo6UU I hope that helps! What a genius and affordable idea! Love it! This looks amazing! It looks like the real thing and you can’t go wrong with the price! Great option if you’re renting or just don’t have the budget for new appliances. Wow! Thank you so much Lorelai! I just got back from vacation this week and this is a wonderful surprise! Wow, great idea! We have a stainless refrigerator but a black dishwasher. Doing this should tide me over until we redo our kitchen. WOW, it looks great! Thanks for sharing at Thursday Favorite Things! Oh WOW! I want to try this so bad now! This looks AMAZING! You’re so right…..it does look like the real thing! Thanks for the great idea and tutorial! What a great idea ~ this makes a huge difference! Thank you so much, Megan! Saving money while updating is a great match! i wish my dishwasher was a flat front so i could do this to it! ugh. such a great fix. Wow that is extremely practical and could save someone A LOT of money. What an amazing idea. That’s awesome! Small prices for huge differences are the best! Wow!! Thanks for this idea. I purchased new appliances for my kitchen because of a fire. The dishwasher didn’t work and needed to be replace prior to the fire. So, that purchase was on me. I had purchased a stainless steel refrigerator because I decided I wanted to go from white to stainless steel. Well, later I ran across a over 500.00 dishwasher for 200.00. But it is white. I couldn’t let that deal pass by. Besides, if it would have been more than 200.00…I wouldn’t have been able to afford it. I didn’t know about the stainless steel contact paper. So, thank you…thank you…thank you. So glad to have helped! Budgets can be grueling, I know. I recently purchased some kitchen cabinets off of craigslist for my office desk for cheap. No way I would have been able to afford those new. Aren’t unpassable deals the best thing ever?? Wow that’s so cool! It looks like a brand new dishwasher with the contact paper. Now you have me thinking what I can wrap with this paper…lol.